Last May, Mr. Garavani and Mr. Giammetti staged a new version of Giuseppe Verdi's "La Traviata" in Rome. On February 9th of this year, they brought the production to the Palau de les Arts Reina Sofia, in Valencia, Spain. Legendary tenor Placido Domingo performed the role of Germond; Queen Sofia herself attended the premiere. For Mr. Valentino, the event was more than another memorable visit to Spain. It was also a fashion homecoming. Over the years, Mr. Valentino has taken many fashion cues from Spain. Look no further than his Spring/Summer 2002 ready-to-wear collection, which had flamenco flounces for days and broad, taut cummerbunds fit for a matador. 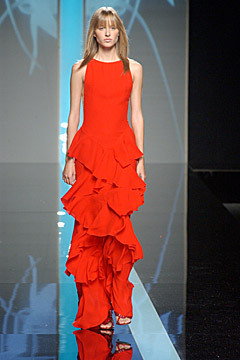 But Mr. Valentino's debt to Spain is most fully revealed in his Spanish-inspired gown from the haute couture collection of the same season: The long-sleeved, empire waist gown, worn by Karolina Kurkova, has the pomp of royals in a Velazquez portrait, but its real tribute to "La Furia Roja"—the Red Fury, as Spain is colloquially known—is the color. Spain was the birthplace of "Valentino red." Indeed, it was at the opera, in Spain, that Mr. Valentino discovered his signature color. Then a very young designer, Mr. Valentino was on a vacation jaunt in Spain when, at a performance one night, he noticed that many of the women attending were wearing red. He instantly seized on the color. And naturally, on Mr. Valentino's return to Spain, and to the opera, in February, his gorgeous guest Monica Bellucci was turned out in Valentino red.